Welcome to 24 Hour Alcohol, the place to find your local 24 hour off licence and all night alcohol delivery service in the London Borough of Hackney. 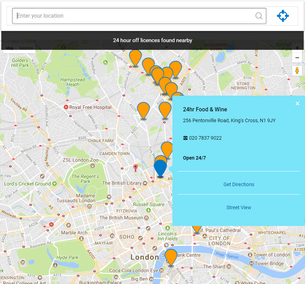 This page shows the locations of shops licensed to sell alcohol 24 hours in the London Borough of Hackney. The 24 Hour Alcohol database includes all off licences (supermarkets, convenience stores, corner shops and garages/petrol stations) licensed to sell alcohol 24 hours a day, so you can buy booze at any time of night. To view 24 hour off licences in other areas of London, see our map of 24 hour off licences in all London boroughs. The delivery of alcohol through the night is available in Hackney from one of London’s drink delivery services. Order beer, wine and other booze for quick delivery to your door – no messing about going to your nearest 24hr shop. Neighbouring Boroughs: City of London, Haringey, Islington, Newham, Tower Hamlets and Waltham Forest. The premises listed on this page are licensed to sell alcohol by the London Borough of Hackney licensing authority.